SEO for tour operators is the technique of using search engines like Google and Yahoo to bring more visitors to your tour website. The most important thing for tour operators to realize about SEO is that it’s not difficult – in fact, you’re already doing the basics. If you have a website that markets your tours you’re already attracting some natural, organic search engine traffic. 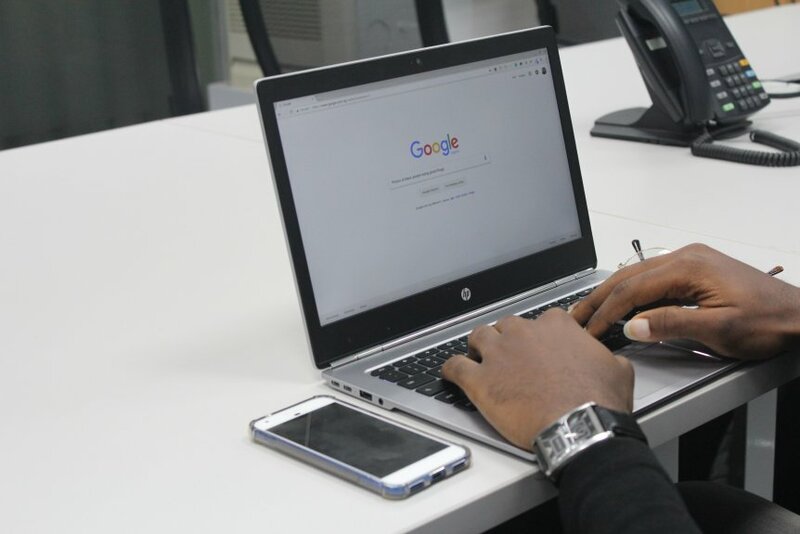 This post will give you some tips on how to improve this process, make it more efficient, and increase search engine traffic to your site. The next thing to realize about SEO is that it’s essential – you must have a strong SEO strategy. SEO provides the best return on investment and is the most cost-effective action you can take to bring traffic to your site because an SEO optimized page keeps bringing in traffic for free, year after year, and when done correctly this traffic actually increases each year through the effect of longtail keywords (we’ll discuss longtail keywords in more detail in a future post in this series). Don’t spend money on social media or ad campaigns before maximizing the search engine potential of your website. After building your site, SEO should be the next step. Once the essential step of SEO is in place then you can look at further increasing traffic through other channels like social media and ads. Finally, you can do SEO yourself, for free. You don’t need to hire an SEO consultant or agency to do this work for you, all you need is a website built on a content management system that allows you to edit the key page elements that contribute to search engine ranking factors (of course, TourismBuilder both allows you to do this and provides assistance in the form of an SEO plugin which evaluates your pages and coaches you on how to improve them To learn more about how please contact us). Now then, it’s important to understand how search engines work. We’ve already discussed the basics of this in our posts on Tour Content & Translation Recommendations and Tour Website Best Practices but we’ll go into a bit more detail here. Search engines like Google use an algorithm to calculate how useful your site is to visitors for the specific search terms they enter. 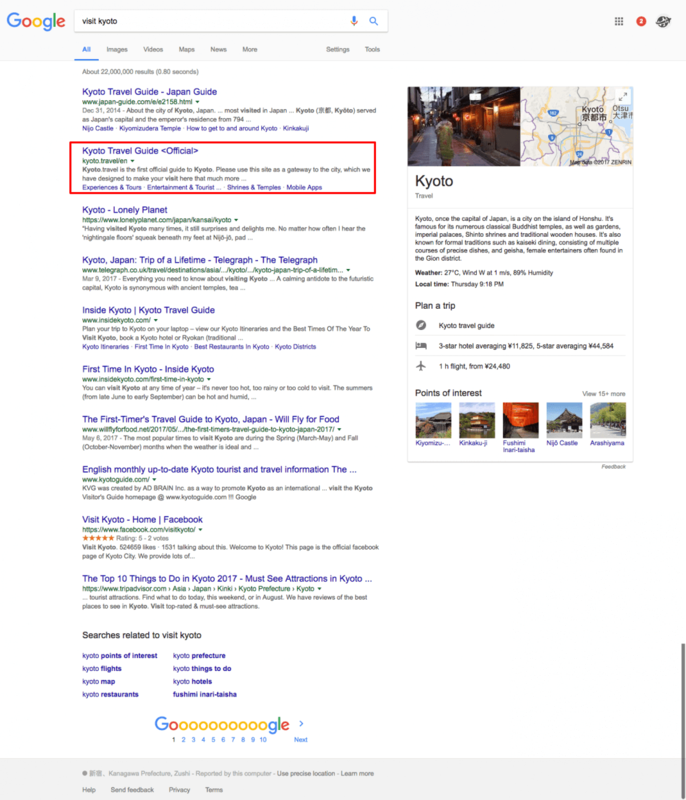 For example, if your destination is Kyoto then you want potential visitors to search for a term like “visit kyoto” and find your site listed at or near the top of the search results. In fact, you ideally want to be in the first 3 listings. A recent study shows that 33% of traffic goes to the top listing, 18% to number 2, and 12% to number 3. Number 10, the last listing on page 1 of the search results, gets only 2.4% of traffic. In this example the kyoto.travel/en official site ranks number 2 for “visit kyoto”, which is not bad, although number 1 would be ideal. Quality content. Travelers need to be able to enter a search term, find your site, and feel like it answers their needs. Your content needs to be well written, engaging with a clear narrative, and enough detail to draw users in and keep them reading and clicking through the site. Links from other sites, also known as referral links. If many other websites link to yours it’s like many votes of confidence saying that your site is a quality site with good content. Other sites won’t link to yours if your content is too little, poorly written, or uninteresting. Focus keywords. It’s important to choose a focus keyword and use it in the title, first paragraph of text, and throughout the page. For example, an article about the Akihabara district of Tokyo might use a focus keyword like “Akihabara Shopping”. Be careful to use a natural balance of your focus keywords, not too little or too many. If you use a keyword too many times on one page Google will see it as “keyword stuffing”, a method unscrupulous marketers use to try to improve search rankings, and they will penalize your site by ranking it lower. TourismBuilder also has focus keyword analysis functionality built into the SEO plugin. Length of content. Each page on your site needs to have enough content, at least 300 words (for the travel industry, the target page length is 2,500 words. That’s long enough to tell a good story and keep visitors interested, and as discussed below recent studies show that the top travel related sites on Google have an average of 2,500 words per page). Spelling and grammar. Google checks to make sure that your spelling and grammar are correct and will rank your site lower if there are too many spelling or grammar mistakes. This is why it’s very important to get a native check of all translated content on your site and never use machine translation! Images. Don’t forget to optimize images as well as text. With the increasing popularity of image based social networking sites like Pinterest and Instagram, many travelers are searching for images as they plan their trip. Every image on your site needs to have a title that matches the page focus keyword. Search engines will look at the image and try to find a match with its tags and the text that surrounds it. Each image alse needs an “alt tag”. The term “alt tag” is a commonly used abbreviation of what’s actually an alt attribute on an img tag. For any image on your site the alt tag should describe what’s on it. Screen readers for the blind and visually impaired will read out this text and thus make your image accessible). Images also need to be optimized for size – heavy images will slow down your site and give a negative rating. Site speed. As discussed in our post Why Your DMO Site Must be Mobile Friendly it is extremely important that your site loads quickly and provides a fast browsing experience for both desktop and mobile users. If your site is too slow to load Google will give it a negative rating and display it lower in the search results. This is because slow sites frustrate users and provide a poor user experience, and Google doesn’t want to show sites that give a poor user experience. It’s essential that your site be hosted on a powerful server that can handle international traffic (cloud hosting is best), utilize a CDN (content delivery network), and have optimized page coding and images. Top-ranking URLs in the travel industry have 57% more words than the general average measured across all industries, with an average length of 2,500 words. Travelers are looking for detailed, quality content and it’s important to give it to them! Travel-industry landing pages on Google’s first search results page use 38% more images of at least 200 x 200 pixels than pages of other industries. This shows the importance of images to travel related search. Travel websites have longer text with a higher content relevance than in our benchmark whitepaper (2,500 words). At the same time, the keyword density for high-ranking URLs in the travel industry is far lower than the overall average. This clearly shows that useful, holistic text content – supported by the use of suitable images – is even more important for travel domains than for websites in general. Lists on travel-industry websites have more bullet points with an average of 18 (!) compared to all other industries which have an average of 14. 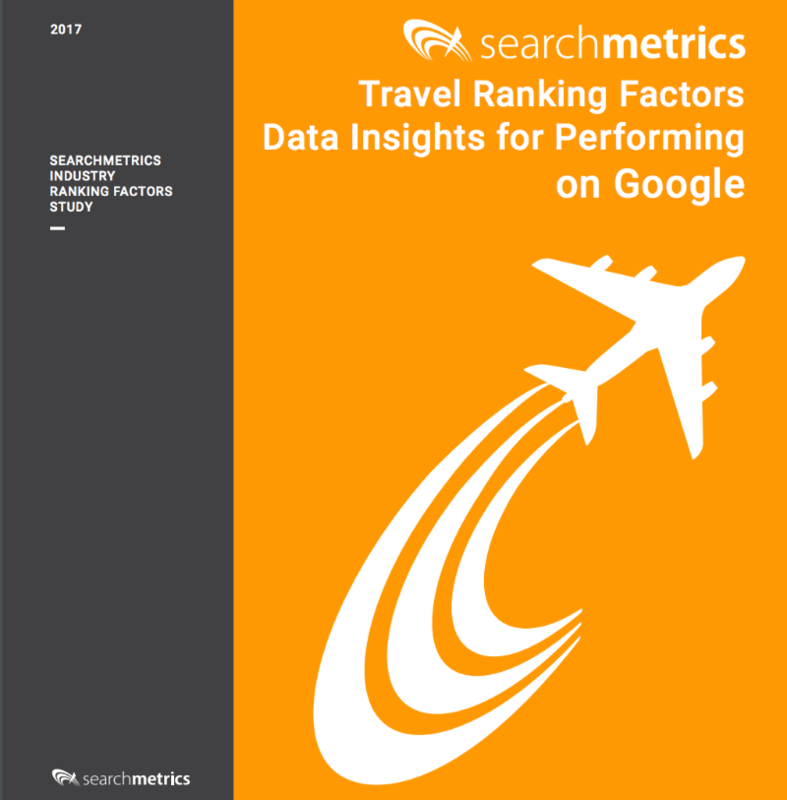 Travel pages on Google’s first page use 23% more internal links than the overall average. Internal links are links from one page of your site to another. Because travel sites usually have a lot of content, these internal links are necessary to help users navigate your site. The content relevance of travel URLs on the first Google search results page is higher than for pages on average. This shows how important it is to optimize your page titles and URLs for your focus keywords. On average, travel landing pages are larger than the pages in our benchmark study. This is the natural result of using more images and longer text copy than other industries. Note that it’s very important to optimize pages so that they aren’t too large, otherwise users will experience page load time delays. Travel websites have far fewer social signals than the overall average across all industries. Given that most destinations are focusing heavily on social media, this is surprising. However, it indicates the importance of having a strong website with quality content as a foundation, before focusing on social media. Social media should bring traffic to your website, as a secondary channel after search. To learn more about SEO for tour websites or to see a demo of how the TourismBuilder SEO plugin helps with this please contact us. We’ll be happy to share more information and help you develop a strategy for your destination’s specific needs.